It’s in between periods, and I don’t really want to edit my full response to the Student ‘Court’ ruling. I’ll put it up tomorrow morning, but suffice it to say that I find grave and serious flaws in their jurisprudence. Basically, I feel that the ‘court’ has stampeded headlong into the realm of policy after a seriously flawed process. The Court responded to my earlier email, and the salient thing for me in their response is the confirmation that they didn’t look at the AUS Election Guidelines. They have asked me not to publish the results on the AMS or Ubyssey website (because, you know, I have control over the Ubyssey), so I won’t release the response on here in deference. Anyway, we’re up 2-0, but there’s a long time to go yet. Go Canucks Go! I have a lot of opinions about the Student ‘Court’ case, but I am first going to ask the ‘court’ whether they feel they have reviewed all the evidence. The focus on the “absence of rules” makes me think that the rules were not read. The following is my email to student ‘court’ in its entirety. I would like the court to take a moment to reconsider their decision. They reference the absence of rules and regulations in their ruling, but no reference is made to the AUS General Election Guidelines, or the voting info. Specifically, the statement that there were no appeals procedures aroused my interest, because the appeals procedures are clearly enumerated. I would also ask the court to clarify whether it is invalidating all of the AUS elections, or merely the Presidential race. UBCvotes.ca, the online repository of all such information. Bing Thom – far and away the most amazing. for an icon, its gotta be bing. During their entire presentation they seem like they are terrified to be presenting to us. They had an interesting presentation, but a lot of what they’ve done seems to be that kind of glass box thing that is already ubiquitous at UBC. I don’t really want another Ladha Centre, as awesome as that building is. I like the Buchanan renovation – it’s interesting, and a lot of what they do looks wierd (read: good). I want an iconic building, one that will define UBC. They have some really cool designs. Something that kind of nags at me is the fact that they have done a lot of student union buildings before, so I worry slightly that they are going to come into it with a lot of preconceptions. Mind you, that’s not necessarily a bad thing – are we really that different from everyone else? This blew me away. The process that they go through, in terms of collaboration and holistics, is something that I think will really make the AMS an integral part of the process. I LOVE the fact that they went into the archives to check out what the AMS experience was when the current SUB opened. BTA has the most wonderful designs of any of the architects, far and away – if we want an iconic building BTA is your best bet. They seemed to be the only folks to get the idea of sustainability right – they have a holistic view, and one that seems like will produce, generally, a better final product. These are interestingly enthusiastic people. The design cube is a pretty cool, and belies that kind of understanding of the AMS and the student experience that is integral (in my mind) for a good architect. Their website for the project is a great idea. They are really focused on sustainability, which is cool, though, too be honest, I tend to prioritize programming over sustainability. They did build Marine Drive, so that’s a strike against. Oh, but one of the guys goes to Burning Man. So, there we go. I remember the Davids of Cannon being around when I was an exec. I didn’t really have any interaction with them byond the perfunctory. Oooh, Jeff Friedrich is in their video! Darren Peets too! It’s a veritable parliament of hacks. (That’s what hacks come in – parliaments. We’re like owls.) They… are ok. Nothing really bugs me, but nothing seems to stand out either. Again with the focus on sustainability – I feel that if the sustainability of the building is the most important thing, you might as well not build the building. Programming has to come first, and the sustainability has to be integrated. They have some cool looking buildings, but, and I think that this is just my sense of style. If you like the stuff that they do, you should consider them. They seem to have the third best method of integrating themselves into the community. They have a broad idea of what the consultation structure would look like, but they didn’t really seem to demonstrate that they get students as students. Editor’s Note: I was going to put some clever and snappy title up there, but there really didn’t seem to be anything that really captured the spirit of the piece. The saga of the Equity Program is probably close to being closed. This originally started off as a response to a couple of questions from the Ubyssey, but it grew longer and longer, and I wanted to make sure that my whole reasoning was put out into the zeitgeist. On another note, I officially no longer have a vote on AMS Council, as of around 1:40 PM yesterday. It’s been a crazy four years. The Equity Program was ill conceived from its inception. The genesis of the program was initiated near the end of the term of the 2007-08 Executive, in a motion that passed to evaluate the AMS for instances of systemic discrimination within its operating structure. Specifically, the AMS wanted to look at whether the procedures for accessing the AMS were inherently and structurally biased towards one group. A motion was passed to conduct a climate survey of the organization, with the intent being that the society would revaluate its structures after the return of the survey, and take such steps necessary as to ensure that there were not overt or systemic barriers to the full involvement of every student in the organization. To me, the process seemed sound: identify the problem, devise a solution, and implement the solution. This didn’t get done. Instead of putting out an RFP for the climate survey (something that was eventually done), a group of people within the AMS decided that they, without the benefit of any kind of evaluation, had the cure to all that ailed the AMS. They decided that they, for this problem which the AMS had only begun to excavate from the earthy mounds of mystery, knew best. The solution that they promulgated was the Equity Program, a solution for a problem we weren’t even sure existed. They skipped the very important first step in the process, that of identifying the problem, and jumped straight to implementing the solution that they had wanted to impose in the first place. I can see how a narrow minded ideologue would see these steps as appropriate and reasonable, because for them the solution to any problem is the same. When one views the world through a specific set of lenses, they will see the same problems that they have been taught to look for, whether these problems are either there in the first place, or having a real and substantial impact on the lives of people that they were trying to help. In doing this, they created the Equity Office, and passed a policy which imposed (theoretically) mandatory training and procedures on the clubs far and away more than what is required for the administration of a club bank account. As someone who has prided himself on defending the autonomy of the constituencies and the clubs, this was a deeply and dangerously intrusive policy, one apt to provoke resentment of the AMS and damage our relationship with our subunits. It was this same program that came to the AMS, when asking for an assistant only halfway into its first year of operation, and said basically that, beyond listing the number of people that they had trained, there was no way of evaluating the success or failure of the program based on any kind of empirical data, because if they were doing their job right there would be no way to tell. To my already sceptical ears, this sounded like a request for more money without any accountability or oversight. There was no effort made to create evaluative metrics against which the program could be judged. It was this same program, one that was ostensibly created to help make campus a safer space, that during the Council debate on the disabilities seat motion, single-handedly created one of the most charged and hostile Council environments that I’ve seen in my time at the AMS. I have been supportive of every step along the way that moved towards a data based approach to equality evaluation, and I do believe that it is possible, if not likely, that the structures of the AMS inherently favour the inclusion of some groups to the exclusion of others. However, I do not feel that this is going to be addressed by the erstwhile Equity Program, a program with ideological roots that feed off of self censorship and which promotes a brand of suffocating political correctness to the detriment of honest political debate. It was a watered down version (especially because of the mandatory training and implementation of the program that the AMS mandated, but did not enforce) of the ideological re-education programs imposed on students at the University of Delaware, and of other programs on diversity consciousness that promote a self-righteous self-loathing that may as well be called ‘the white-man’s burden for the modern age’. The AMS climate review is continuing apace as we speak, and I’ve signed myself up for one of the sessions. I do have some very significant concerns in terms of selection bias in the survey, but I hope that it is able to identify where the structures of the AMS are preventing the full engagement of our members. The money we spent on the Equity Program this past year was wasted on implementing a solution before identifying the program, and those who championed it prevented the AMS from taking any real action for another year. The money spent on the Equity Program could have been used to promote the climate survey and solicit broad feedback, which would have alleviated some of the concerns that I think, due to the (rather small) amount of marketing done to promote the survey, are going to manifest themselves with respect to selection bias. The money, which at best impacted no more than one in six of the clubs on campus, could have been used to greater effect in any number of ways, generating more utility for the AMS membership. We deserve better from the AMS, and we should be able to expect that the people spending our money are going to try to use every cent of it to improve the lives of students in a way that can be justified by logic and research, and quantified with results. We should also be able to expect that people in power do not use the name, weight, money and power of the AMS as an ideological chew toy, something that has gone tragically unfulfilled these past two years. Students deserve better. During the VFM contest for the upcoming (ongoing) harmonized elections, Matthew Naylor will be on sabbatical, as he is the AUS Elections Administrator. Cheryl Kornder, Omid Javadi and others will be blogging on the RBT during the campaign period. 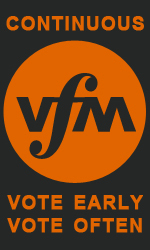 Y’all should vote for them on the continuous VFM ballot, linked to on the side – Vote early, Vote often! I stumbled across http://www.codeorgan.com/ today, and I found out what the Tribune sounds like – this website transforms the code of any site into a song, using… let’s just go with magic. The RBT song is a little plodding, and it always feel that the notes are being played a little to early or two late – like a drunk person doing Dance Dance Revolution, which I suppose it accurate enough. Please remember to vote for the Radical Beer Tribune in Continuous VFM. In this whirlwind of a morning we’ve seen a meaningful referendum result retracted, and a meaningless one pass. The RBT will be elaborating on how the passage of question eight means nothing for the Society in any way, shape or form later this weekend. The only functional point here is that Bijan starts work two weeks from today, rather than today. That’s going to be an awkward transition to be sure. Or, if we’re lucky, maybe Tim and Blake will just resign. For clarity’s sake on these, the amount of Yes votes as a percentage of the overall student populace (46,438) must be greater than 8%, and the vote must pass by a majority or, for special resolutions set out as set out in the Societies Act, a seventy-five percent majority. This work is licensed under a Creative Commons Attribution-Noncommercial-Share Alike 2.5 Canada License, except for the exclusive commercial use of participating in the Voter Funded Media competition.